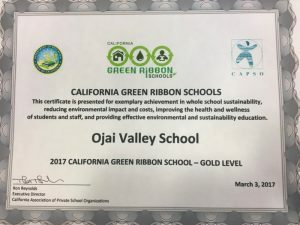 In recognition of its long-standing commitment to environmental conservation, preservation and sustainability, Ojai Valley School has been named a California Green Ribbon School, the state’s top honor for environmental excellence in education. State Superintendent of Public Instruction Tom Torlakson announced the Green Ribbon awards Friday, lauding more than two dozen California schools and school districts for reducing their environmental footprints and engaging students in environmental literacy. The gardening project at the Lower Campus teaches students plenty about environmental preservation and conservation. 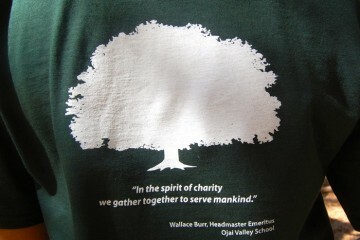 OVS was one of three schools in the Ojai Valley, and one of seven independent schools statewide, to earn the Green Ribbon title, receiving Gold Level recognition for the award, the state’s highest designation. The award – the result of a lengthy application process spearheaded by OVS Director of Technology and Sustainability John Wickenhaeuser – acknowledges efforts at OVS in recent years to reduce environmental impacts and costs, improve the health and wellness of students and staff, and promote environmental and sustainability education. 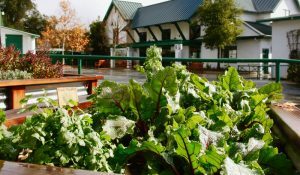 For example, in response to California’s ongoing drought and keeping with OVS’ commitment to sustainable practices, the school set out several years ago to reduce water usage on its campuses and facilities, replacing grassy areas with mulch and drought-tolerant plants, installing weather-based controllers, and optimizing irrigation. 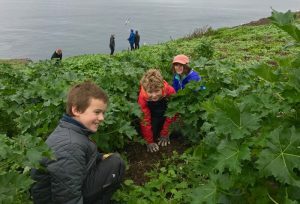 Fourth grade students doing restoration work at Anacapa Island. In addition, the school installed a state-of-the-art irrigation system in its equestrian riding arenas on both campuses, and replaced the fine dusty sand in those arenas with a new footing made from a mixture of quartz sand, polyester and synthetic materials. The move drastically reduced the need to water the arenas to keep down dust. Taken together, those conservation measures have saved nearly 10 million gallons of water since 2013. 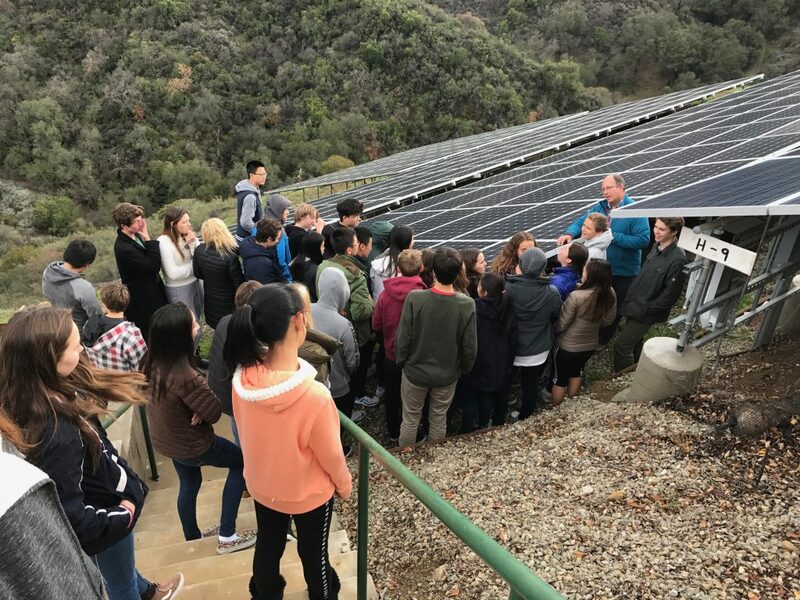 In other areas, OVS four years ago installed a 1,001-panel, 274-kilowatt solar array that produces more than 95% of the electricity at the Upper Campus. The solar panel project has reduced electricity use and green house emissions by 56%, and OVS hasn’t had to pay an electric bill at the Upper Campus in more than three years. Another important part of OVS, and an important criterion for Green Ribbon School recognition, is environmental education. Outdoor education starts in pre-kindergarten and continues through the 12th grade at OVS, featuring multiple camp trips each year to national and state parks, mountain ranges, and campsites close and far. Those trips are meant to be fun, for sure. But they also are in keeping with the school’s fundamental commitment to use the outdoors as extended classrooms to teach students the importance of conservation, preservation and good stewardship of the land. Over the past two years, OVS has partnered with the National Parks Service on their “Hands on the Land” initiative, which brings restoration work to the Channel Islands. Funded by the National Environmental Education Foundation and the Environmental Protection Agency, the grant has been used by students and teachers on both campuses to access the islands and use them as living laboratories, tackling projects including working on-site in nurseries, removing invasive vegetation, and gathering and compiling plant restoration data. 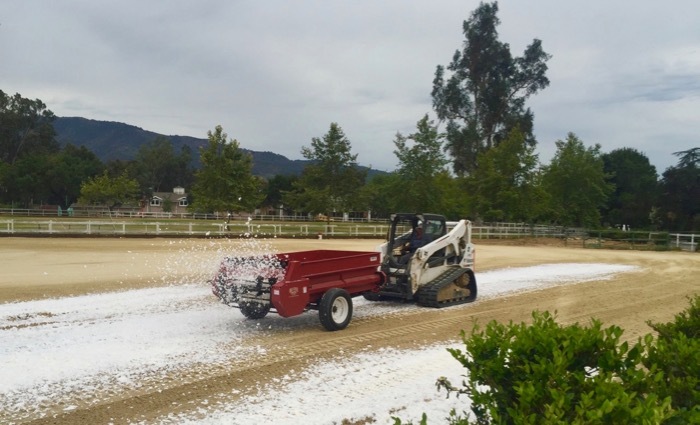 Last school year, OVS replaced the fine sand in its equestrian riding arenas on both campuses with a new footing made from a mixture of quartz sand, polyester and synthetic materials. The move drastically reduced water usage at the arenas. Students in grades four to 12 participate in those excursions, taking trips to the islands throughout the year. So far this school year, fourth grade students and AP Environmental Science students have taken trips out to the islands to remove non-native species. 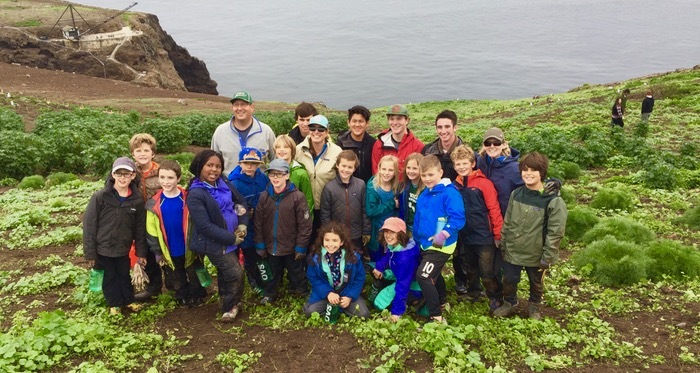 And,even as the Green Ribbon awards were being announced, OVS fifth graders were on a trip to Anacapa Island to continue the restoration work as part of the federal Hands on the Land grant. 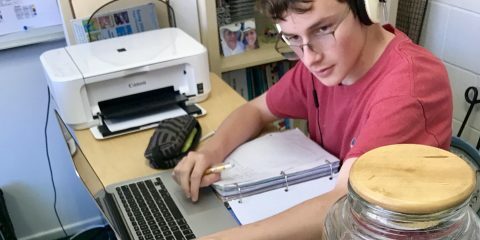 The school plans in coming years to continue with water and energy conservation, recycling, and develop more partnerships such as the Hands on the Land effort. In providing that validation on Friday, state Superintendent of Public Instruction Torlakson told the educators gathered for the awards ceremony that there could not be a more important time for environmental education. He cited the threats of deregulation of environmental protections and the need for inspiring future generations of innovators to protect our resources. 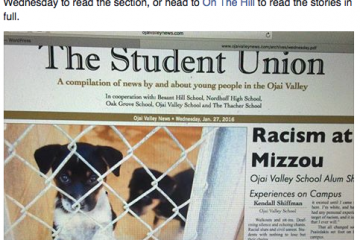 OVS high school and elementary school students combined on a trip this year to do restoration work at Anacapa Island.